The common complaint about this race is the extreme heat, but that is when it is held in June. This year, it was held a month later and everyone feared that it would lead to even worse race conditions. Most of the course has no shade and is blacktop, which would radiate even more heat, but luckily this year the weather was overcast, saving us from the direct sunlight that would normally make this a much tougher course than it would appear to be. Although it was still quite warm and humid, the direct sunlight above and the blacktop of the stadium parking lot reflecting it were removed, making for a more pleasant race course. As race time approached, I took my football and headed out from the field and across the parking lot to the corrals. We prepared to run as past and present New York Giants players were announced from the stage, including ones who would be running with us, and then the race began as usual. We headed out straight before turning right and making our way towards and around the Quest Diagnostics Training Center, where we hit the first mile marker on the other side of the building before turning back, where we could see the walking participants heading towards the center as we ran away from it. We could see the stadium off to the left as we kept running around the Meadowlands parking lot. As we turned the corner by mile 2 and grabbed water from the hydration table, we could see the most dreaded park of the course, a large hill that loomed before us. 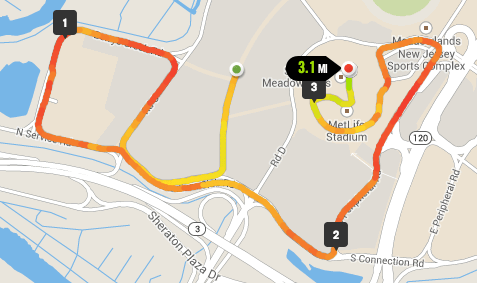 Pushing up the hill in the heat was tough, but again the lack of sunlight made it easier than the prior two years and once we crested it became a gradual downward run to the outside of Metlife Stadium. Running the shaded sidewalk around the stadium, the sounds of the people inside the stadium grew louder until we reached the ramp that led us in and onto the astroturf. It was a quick turnaround and it led us to the straightaway that was the final 100 yards. It was this final part of the run that led me to carry a football for over three miles. 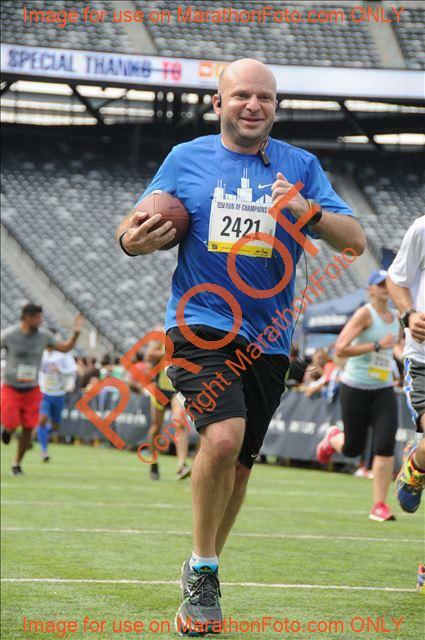 100 yards down the field with a football cradled in my arm until I crossed the goal line and completed my 5k journey. The lack of direct sunlight made this year’s New York Giants Run of Champions 5K a more pleasurable experience and one that was far easier to run. My final time was 24:38, which became a new personal record time for a 5K, giving me four PRs in a row for the races I have run this year.